The Bank Of Jamaica has issued 1,000 gold and silver coins to celebrate late reggae star Bob Marley. 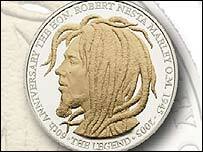 The commemorative coins bearing the star’s dreadlocked likeness are being sold for $100 (£55) each. Made by the British Royal Mint, they were intended to mark the 60th anniversary of Marley’s birth in 2005 - but have only been issued now. “We’ve received quite a bit of interest already,” said bank spokeswoman Jacqueline Morgan. There was no explanation given for the delay in issuing the coins. It is the second time the Bank of Jamaica has issued coins bearing Marley’s likeness in his homeland. “The coins to commemorate his 50th birthday have totally sold out,” Morgan said. Marley, who died of cancer in 1981, was one of the most iconic figures in music, and arguably one of the most famous Jamaican in history. He shot to fame in the 1970s with hits such as No Woman No Cry and I Shot The Sheriff. In February it was announced that his home in Jamaica was to be declared a national monument, 25 years after his death. Update: I’m not sure of the details of ordering, but I would imagine this page at the Bank of Jamaica is where they would be offered. It’s possible they’re already all sold out. You can try e-mailing the address on that page to get more information.